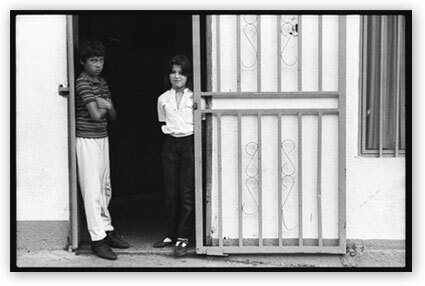 It’s another hot, 30 degree day in Vancouver, and it reminded me of the early morning heat of South America. Today’s minor thought about the CBC lock-out. It’s too bad the CMG, the union that represents those locked out employees at CBC, don’t get the web or the Internet. With the lockout at CBC, it would be the perfect opportunity to use the power of the ‘Net. Lots of their members do – but most of them have found themselves without email, since they’ve relied on their free corporate email accounts. CBC has a very good web interface to their mail system and one of the perks of working there is web mail. Understandably, most treat it like a personal account, so much so that some were surprised when it was shut down. Doh. If the union was thinking, they’d adopt the same naming conventions used by CBC, (firstname_lastname@cbc.ca) and give all their members email accounts with a cmg.ca domain instead of their cbc.ca domain. Meanwhile, CBC’s heft in the media world shows up in the most interesting ways. In today’s Vancouver Sun online edition, a long story about the union complaints about BBC material on CBC, and how they’re rallying their union brothers/sisters in the UK to pressure the BBC. 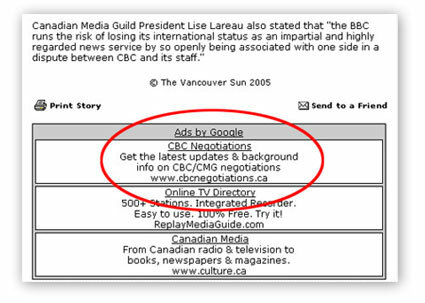 Down at the bottom of the page, as part of a Google Ad buy – there’s the link to the CBC corporate pages , giving their side of the story on the labour dispute. Smart. This is the first of these I’ve seen, but I’m sure they are all over, since CBC has tons of ads in the blogosphere. Chalk one up for good use of the ‘Net. Meanwhile, there is lots of hoopla over locked out CBC staffers taking up the podCast as one way of flexing their might. It sounds grand – all those talented radio folks especially, out there, quite capable of launching their own alternate service on the web. Five days into the lockout, and so far they’ve only been able to come up 7 minutes of material. Ouch. With luck they’ll make me eat my words. So far most of the locked out member blogs have been about how hard it is to spend 4 hours on picket duty. Tod Maffin has a list of the union members’ blogs on his site. Oh, and just for the record, the OUIMET blog from Toronto is no relation to me. This is me here.